a dream, it is holding, carrying. The same thing, carrying part of itself. A thought originating from darkness. After U emerged until it ‘cancelled out’ the thought and became three dimension. It was there all the time, but simply had to be found. Is the part that is being held more important than that which is holding? Is that which is holding more important than that which is being held? It is a unit of two in union. It is not ‘One’, but more it is ‘Two’. 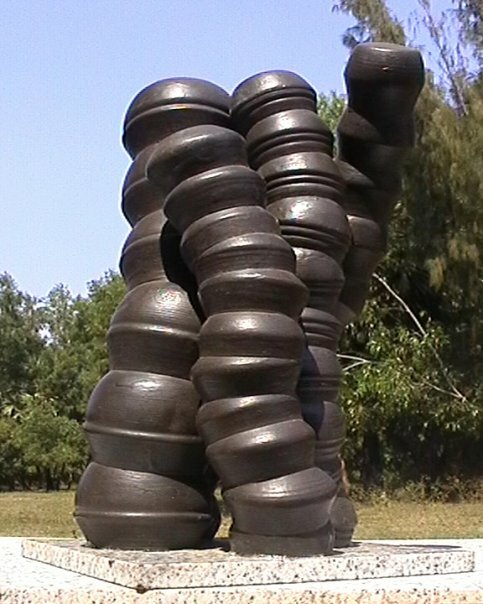 Sculpturally it is concerned with the idea of weight, the form is this round heaviness. The two forms are closely related, if the negative space in the ‘holding piece’ were to be filled, it would have the same volume as the held piece if the ‘grooves’ in the held piece were also ‘filled’ and the ‘roundness completed. Thus both pieces come out of the same proportionate volume. This is particularly important in the realization that the holding piece has to have the negative space filled by the held piece in order to be somehow ‘complete’. The held piece must remain to balance the fact it must compensate for that which is ‘missing’. This attraction of weight and form, keeps the energy and attraction of the sculpture that is neither One nor Two. Before you there is outer space. Therefore there is also inner space. In this sculpture the inner space is particularly important, particularly significant. The inner space is circled by matter – carefully worked pieces completely different from one another originating from the same piece of stone. Significantly perhaps, it is a monument to the unknown forces coming or appearing together. It is circular, much if not all we know is circular in one aspect or another. The universe, orbiting of planets, electrons, and atoms, water ripples, sound waves and so on. 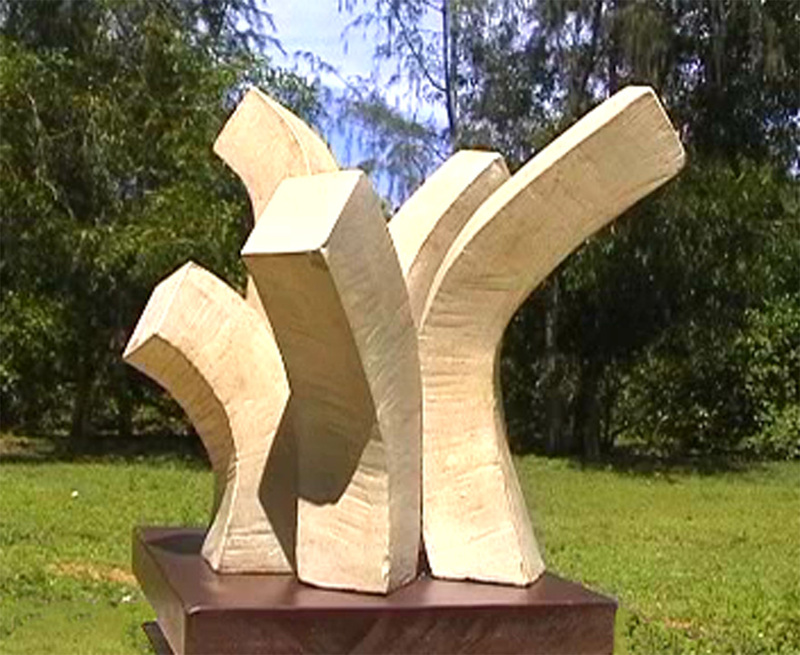 B4U is also simply a sculpture working in space with form, colour, line, and plains. Light and shade are very much integrated with the work and carefully organized. Seemingly chaotic, it is a piece thoroughly planned and controlled. Although robust the piece is a delicate play with volume, curve and textural flat plains diffusing the surface areas. The position of the end square of the units is most critical to the work. The square surface plains are offset to an ‘imaginary centre’. This is with reference to ‘star sights’ carried out in astronomical navigation with shipping. The ‘hour angle of Aries’, is hypothetical, yet the navigational position lines are worked from this’ imaginary position. The ‘collaboration’ of the units creates a ‘one-ness’ through cast shadows that connect the units through a dance and play with natural light. In larger renderings this ‘play’ is a predominant feature of counter-change where the group make themselves through the sharp contrast of deep shadows and light stone, absorbent, rather than reflective. 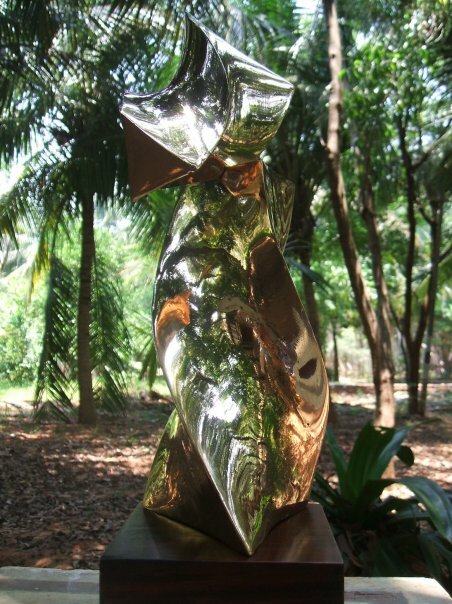 When the material is highly reflective in its nature, the mood leans towards ‘dance’. Whatever material, the work is one of optimism, an explosion of energy; with the inference of a magical ‘space’ within that is apparent but not visible. Five Parts is one in ‘The Cornish Collection’, the association being the early clusters of Primroses before flowering discovered in the Cornish hedges, the early messengers; heralds denoting the imminent coming of spring. Material: The choice of material for ‘Five Parts’ is a critical consideration, and will qualify the aspect of the work considerably, and modify ‘tempo’. Small size: Stainless steel, (highly reflective), Polished aluminium, pewter, bronze. Medium: Roman travatine, Cornish granite. 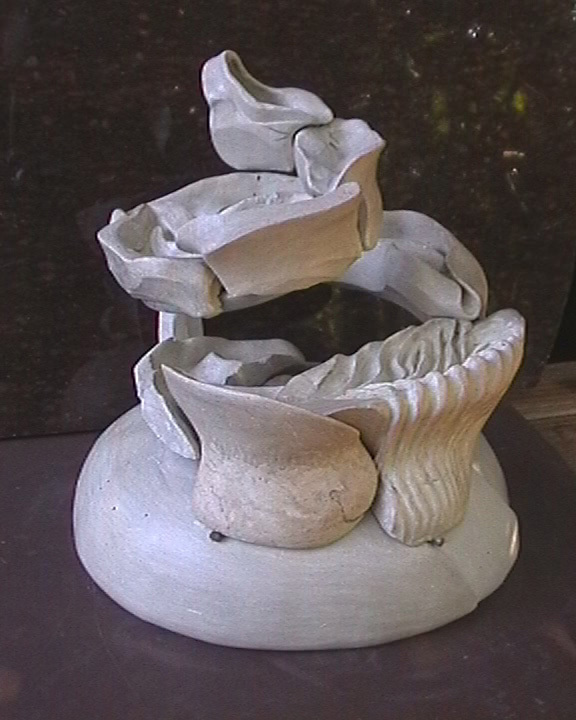 Larger size: dyed cement cast from carefully fabricated molds. Who were the Harappas? Where did they come from? In excavations at various sites we see that these wonderfully creative and inventive people most certainly had a way of mathematical thinking that we cannot grasp, we can only make inspired hypotheses. With pre-Vedic mathematics in the hands and minds of such intuitive intelligence, what did they discover? Harappas Arch is a questioning work, a thought one can walk through. 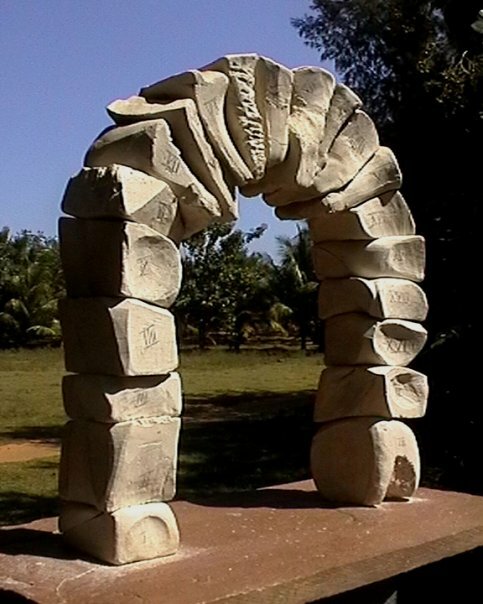 It is an arch indeed – part of a circle, a circle constructed from what appears to be loosely carved, shaped blocks. Yet it is precise. The arch grows in size, and proportion from one side to the other. It is perhaps a living arch. The blocks are carefully considered in the sense that ‘manufacture’ is minimal, that the block is made from the hand, jumping the mind itself – from the half subconscious. Almost perhaps it is that each block has mysteriously emerged. The sculptor has merely been a tool used by unearthly powers the result is a tribute to those unearthly and unknown powers. As a sculpture, it follows classical principals, of divisions, line, weight and proportion. The references are many – being an arch, it was important to make it ‘particular’, not an arch of other earlier architectural forms both in the East and in the West. It is a piece almost as ambitious as reinventing the wheel. A very new, yet very ancient arch, created in memory of a mysteriously wonderful civilization. Once upon a time there were bigger and smaller. They were separated. Each had its own energy force until time connected them in space leaving gaps. Bigger and smaller were then united but remained separated yet somehow connected by the time and the energy force they had acquired. Here and Now, is a monument to Time. 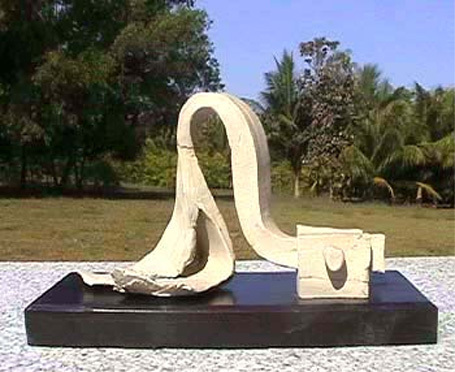 The sculpture is conceptually transient – it has no top or bottom, and can be placed with bigger at the top, or vice-versa – the geometric form is a fragmented abstraction of the symbol of infinity and is time with no beginning, no end. The differing Time frame passing through bigger and smaller, that Time has united and can never be separated yet never be together. Sculpturally, the larger and smaller units are a combination of the organic on the outer edge where the form is amorphous; machined finished in the center being crystalline the time frame is machine finished bronze, square in section, one slightly larger in section than the other. Bigger and smaller are polished stone. The work is very much a counter point play with light, shadow, space and form between organic and geometric, together with the sensation of heavier and lighter. Here and Now, refers to the respective unites, bigger and smaller within a framework of time. The origin of this piece is a block. 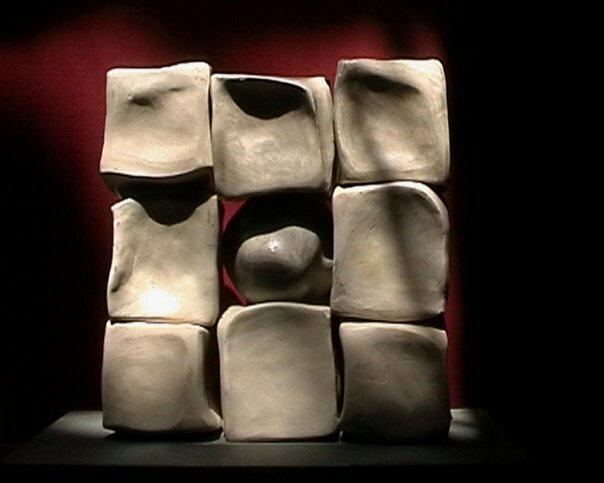 A block cast to the ground and fragmented into eight pieces. 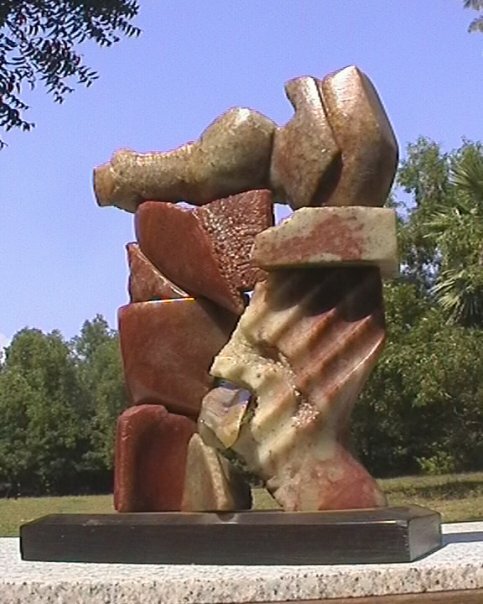 The fragments make up two figures. Placed together, once more, the two in a total of eight parts remain in the block as one. I, and You, two in one. Perhaps Shiva and Parvathy. If I WereYou. Is it You as in I are One? The block was broken and carefully reassembled; yet nothing can be as before. Each piece is carefully reworked so the piece could be ‘one’ again. It is an ‘impossible’ reassembly, or a search for the miraculous. The piece is highly developed and has undergone many fine changes over a period of more, than four years. 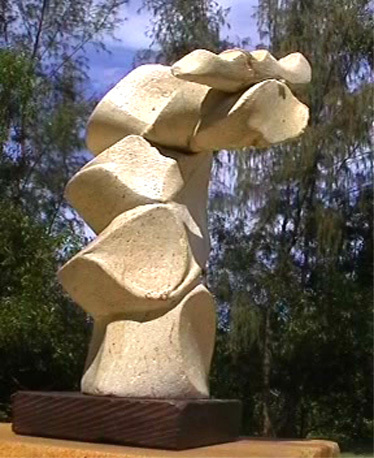 Sculpturally it is a work that plays in light and shadow, and can look very different throughout the day in natural light, and become quite dramatic in artificial light. 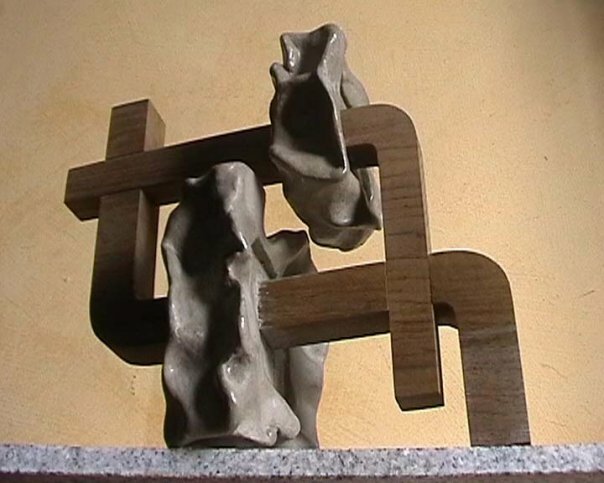 It is dedicated to friend and sculpture, Jorgen Haugen Sorenson. 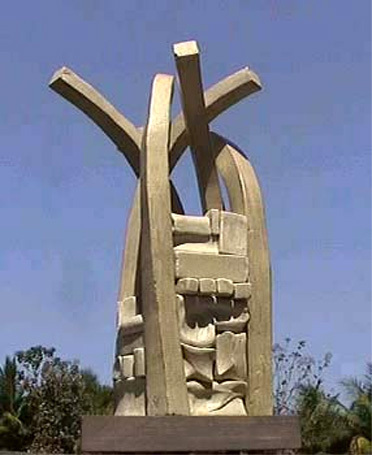 Knowone is a monumental sculpture essentially; yet as with all the 2006 collection miniatures (approximately 12” in height), has also been made in an edition. Knowone is dedicated to all unknown artists that have died without recognition or been killed because of their beliefs. 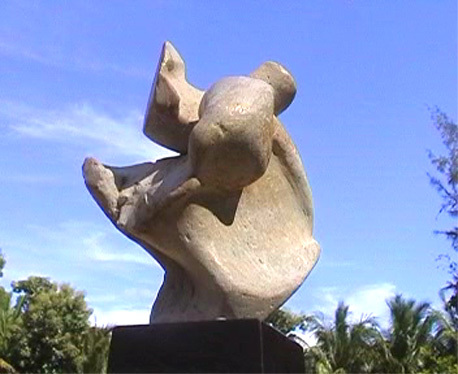 It is a memorial to all artists, writers, poets, dancers, composers, sculptures and painters who remain unknown. Essentially the work speaks for itself; it echoes sentiments of Roman chapels for unknown gods. It is a space enclosed, a space of thought, peace, and silence encircled by a mysterious wall comprised of different components, perhaps the building block of thought and differences. The material is a combination of white Italian marble and bronze. The wall blocks are carefully carved pieces in white Carrara marble with high finish precision. Some polished, others with mat, ‘sabiatta’ finish. 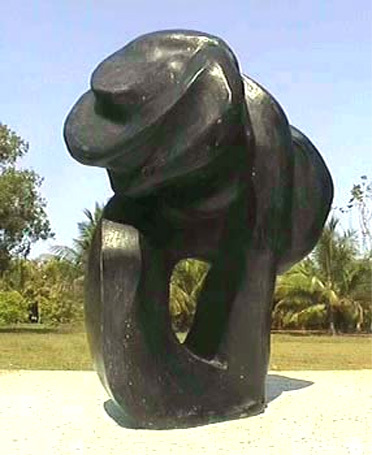 The upright curves are pattined bronze. It is a piece of nobility and classical elegance. KnowTwo; a monumental work dedicated to philosophers and free thinkers. It is very much a piece that is about the unknown and the mystical. It houses a space that never was, and seemingly comes from nowhere – and mysteriously ‘stops’. However, these odd units electrify all the space about. Daffodils in the desert perhaps, or something that is with us all that we don’t fully grasp. We feel comfortable with KnowTwo and can loose our daily thoughts musing upon what it is all about. Not one, but two. Material; full scale of twelve feet is stainless steel. Small miniature edition in 2006 are in variations of gunmetal, bronze and aluminium. It stands alone – separated from others. Confident, concerned with its own form. A proud stone through its parts it turns defiantly. 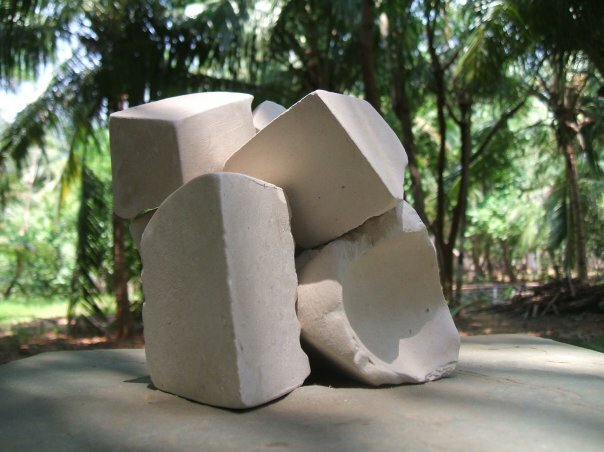 The sculpture is a personality combining, three stone blocks. It is of heaviness, texture, form, line, and particularly balance. NotWithStanding developed over a period of six years and has stood the test of high scrutiny and time. This finished work arrived; no more changes were made or could be made. 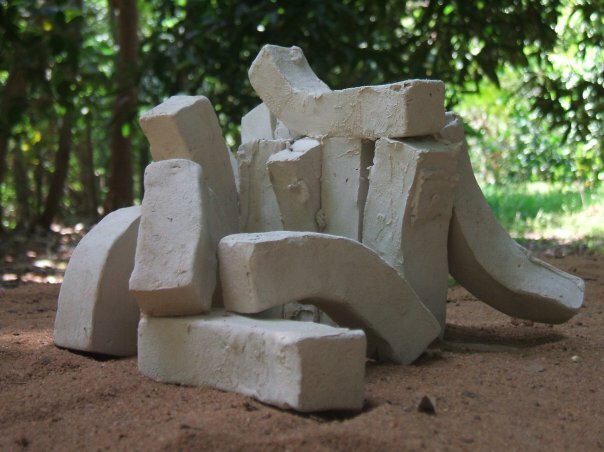 A powerful piece, absolutely about sculpture, stone, and space. It stands alone! 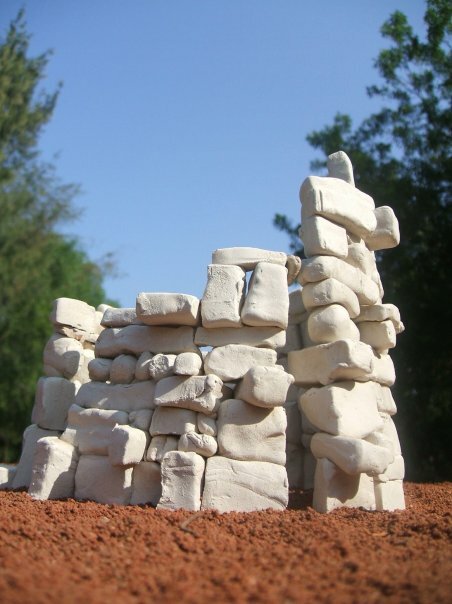 Dry stone walls are an art form, and very ancient land divisions in history. Stones are selected not cut and placed one to another. It is this skilful selection that keeps the wall standing. One stone beside another making a good connection. This creates a strong wall that lasts for centuries. It is removed rather than collapses. Old walls tell many stories, and harbor very specialized plants. The worn surfaces of the stones with moss and lichen growth are likes pages in a book. Others Beside Me has this kind of background. The sculpture is a complex work for it is in fact nine sculptures in one. Each block and the center orb have been individually carved as separate pieces and can ‘work alone’. Yet in the carving the theme is that the individuals work together, the flow of lines and positions of the undulating planes are the result of years of work. The piece had to be mounted and dismounted countless times and went through a number of working models. Like ancient walls, surfaces cast shadows, one upon the other. Others Beside Me could almost be called a sculpture of shadows, for it is the light and shade, which predominantly give the work its ever-changing appearance. Although perhaps at first glance apparently simple, the work is extremely involved, with many philosophical references. The combination itself of nine components with the center orb is metaphysical symbolism – the unknown center perhaps more refined and older, with the others close beside, in the process of transition – liquid and solid state – matter and anti-matter. Or is it indivisible union of particles, things, and ideas, people that ultimately make one; however different the individual units are, and at whatever stage of development they may be experiencing. It is about Others Beside Me – of course! Pardon I Is an object of the unconscious mind. It is the oddness of thought. Perhaps it is something from the beginning, that through a journey, it narrows, modifies and splits into small parts of itself. Yet where did it originate? Could you repeat that? Pardon? Could you repeat that again please? Because time flow is a constant, a constant energy source, it is not conceivable that something, anything, conscious or unconscious, can in fact be, repeated. Pardon is therefore frozen in time forever. A thought, or nothing, of the subconscious that perhaps never was! Sculpturally, it is a linear flow, an interchange and play of semi mechanical planes. The greatest amount of study has been given to the flow of line, and diminution of the form itself, varied from all angles. Seemingly simple, almost banal, the piece is an extremely complex play of surface and curvilinear force within a relatively short linear measurement. The piece is also intended to produce a thoughtful smile! Pardon II is in fact the original version in the Pardon series. Much the same concept of Pardon I. Pardon II is the disillusioned or even dissolving of material, or the reversal of industrial to organic – or organic to industrial – or perhaps, from errrrr-ness to noise – or slurp to banging!!! It is sensation – inspiration; in the sense ‘yes’ I have it! – What is it? What was that? Pardon? Material. 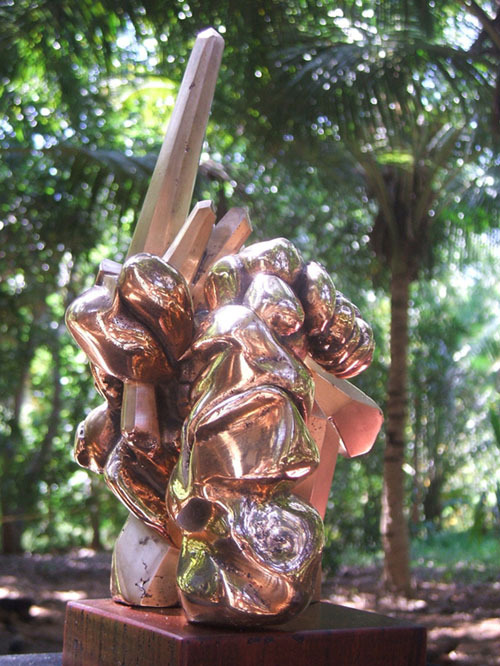 Full size sculptural work in bronze or cast iron. Miniature collection, is in soft stone, bronze, and aluminium. The twisted arch is only suggestive of a passage or a passing through. It is a twisted U. 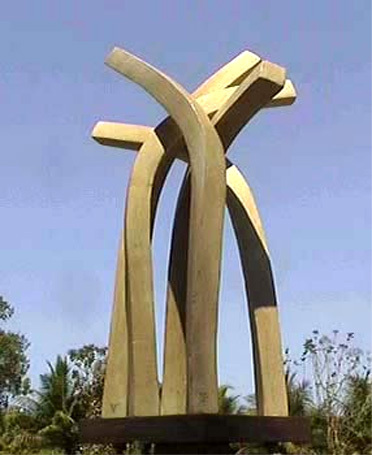 Viewed from the side it defies its’ arch quality and becomes a sculpture with carved parts one in front of the other. It is almost not, what it is. It is precisely wrong. 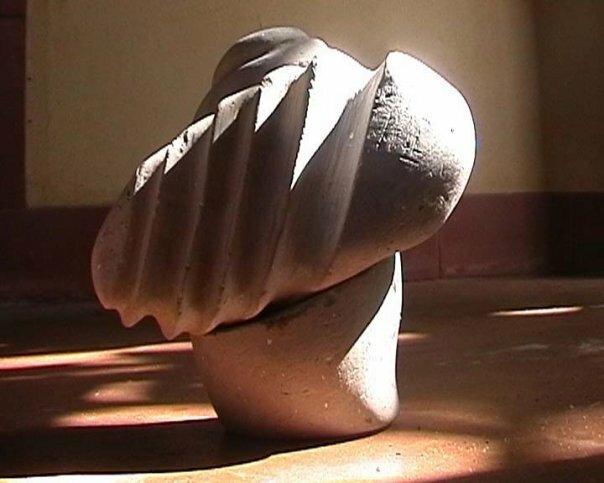 The blocks apparently separate, but in fact carved from one piece (small version) convey the thought of odd connection, how such shapes in this configuration make a precise geometric energy flow figure. It is traveling away from itself, yet still grasps at a foundation or what it could ‘have been’. Some segments appearing to remain ‘orthodox’, parts of what ‘could’, have been ‘once’ – a ‘pure’ arch. The rest have metamorphosed from block to individual. 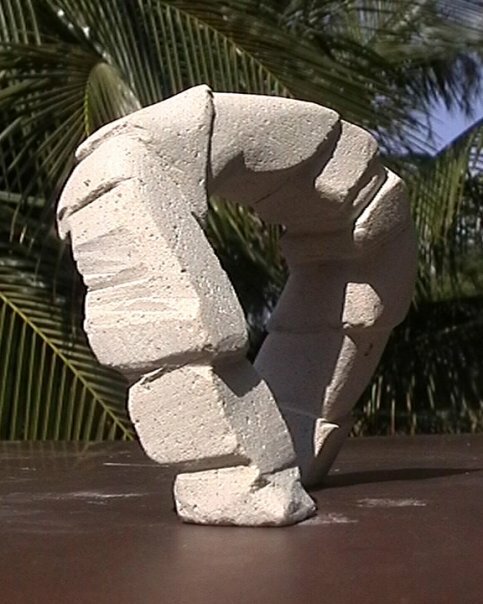 The sculpture is the sum total of the deviation of each segment and twisted as a result to form something else. Sculpturally the work is based on mathematical Greek classical proportions. Proportionate, diminution of volume in the sense that one side of the figure appears the same dimension as the other, or that the distance between the two base parts appear further away from each other, than they really are. However each base block is positioned on the same plane, which passes directly through the center part at the top of the arch bilaterally. Although apparently flamboyant in character, the sculpture follows a strict mathematical principal, which gives it a subtle underlying formality. Dedicated to Max Plank The piece comprises three sets of five units, these units relate in concept to certain properties found in atomic physics. The base set up forms an equation, each ‘organic’ quadrant at the base of each separate unite is positioned on a square grid drawn from the square base, with their centers positioned at the apex of three diminishing pentagons. None of the units touch. There is a counter point play on the mathematical discord between quadrant and pentagon at the base plan. The quadrant terminating each unit illustrate ‘chance’ resulting from a relatively unpredictable flow of lines and plains. Each unit is differing in length, and marginally differing in volume; this aspect is reflective of changing energy levels. There are essentially ‘three’ sets of ‘five’, each ‘set’ occupying one circle containing a pentagon, echoing the ‘shells’ described in the atom. It could be that the notion bares some reference to the seemingly random emission of energy as a result of various ‘collisions’, and that the base denotes the point of observation, and the terminating quadrants on each unite are the dissipation of that energy before beginning again. The constant is the equation drawn out at the base level, and that restriction has the baring of the seemingly random termination arrived through the physical variants of the components. The piece is of a contemplative mood and has many associations within the combined formation. The spaces between the component parts have been carefully considered through many mounting variations and modifications, light and shade differing through the position change of natural light being particularly significant. The work is part of ‘The Cornish Collection’, with an association of Spring Daffodils before flowering. Material. In small versions: bronze, polished aluminum, stainless steel. Medium: stainless steel, white statuario Italian marble. 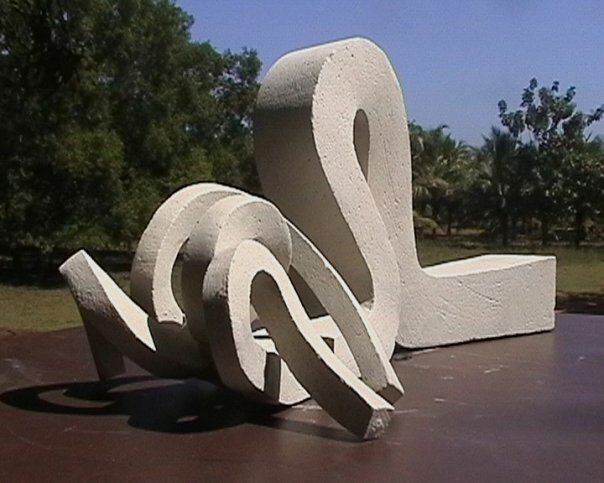 Large: version finely cast white cement. This work developed over a period of more then six years and has gone through several transitions. There are many associations, first and foremost is the number seven, then that of T. E. Lawrence; Lawrence of Arabia. To the seven ancient planets: Sun, Moon, Mars, Mercury, Jupiter, Venus, and Saturn. Perhaps most important it is a piece for contemplation, of rest tranquil yet powerful. Of time, repetition, growth, and rebirth. The spaces between columns are particularly important; the offsetting of the sections energizes the space, which is, in this case, that which forms the columns from within. Notes to second and first variations. The seven pillars of wisdom, or seven planets, have many associations and reference points. Each column represents one planet in the solar system 1) Sun, 2) Moon, 3) Mars, 4) Mercury, 5) Jupiter, 6) Venus, 7) Saturn. The top pool reflects the differing and relative sizes of the planets: (in the case when it is a fountain). The number seven, 7, indicative in many systems of thought as being particularly significant in that; everything that has limited duration is not wholly real. Everything of matter has a limited ‘life span’. Seven is the completion of the material world and the ‘bridge’ to the spiritual world. The seven is recurrent in each column, (in the first and second variations each column has seven segments or sections) seven colours is the light spectrum, seven tonic notes in the music scale, seven days corresponding to seven planets in a week, the seven chakras. And so on. The columns are very much a personification of volume divisions finally making the one vertical. That is each ‘cell’ of the section is carved individually with worked surface, curved, but with planes, not immediately discernable. Although geometric and mathematical – it is yet organic. The columns are ‘carved columns’. 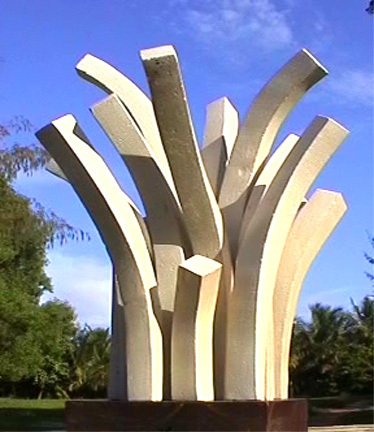 The columns are divided into four unequal sections with no divisions corresponding. The column is therefore one – but also four parts. The configuration of each section from one column to another is a mathematical play on a variation between cone (triangle) and sphere (circle) and volume. The justifications of corresponding 0negative spaces emphasize the change in progression resulting from one column to another. Play of artificial and natural light is particularly important in this emphasis. The recommended size is five feet, material, all black / gray granite, or combination of colours – including bronze, gunmetal. Water flow is slow, fed from the top pool of each column. 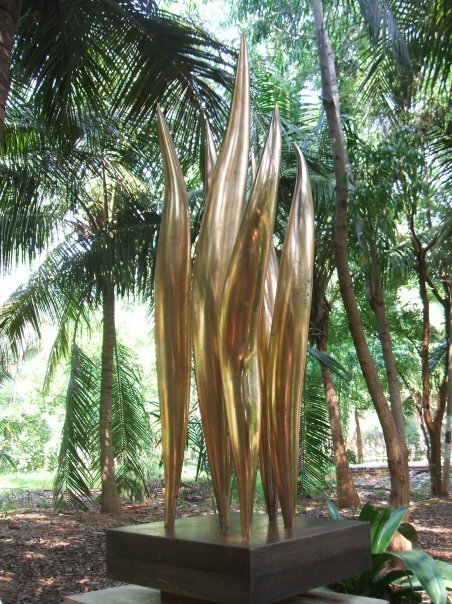 This water sculpture fountain, in ten pieces generates a new ‘energy’ within the water itself as it passes on its journey from on piece to another. Each ‘trough’ is differently composed in a sense to ‘confuse’ the water flow and give it enriched energy as it gently passes over the nine part cycle, reaching the mysterious half dome and disappears through a hole. It is a spiral of emerging activity. The water connecting the different sculptured units and the carved pieces connecting the water, conveying it back to earth. It is a table piece that quickly ‘talks’. It is devotion, abstraction, and relaxation’ a spring, or small cascading stream, an inspiration for daydreaming. Sculpturally the forms are organic, renderings, a kind of language interpreted from the forms found on the seashore and ocean depths formed by the erosion of water dripping, passing, flowing and trickling, the two masters of form; one organic growth, the other Time. The forms are perhaps reminders of odd shapes and shells collected on seashore and country rambles. 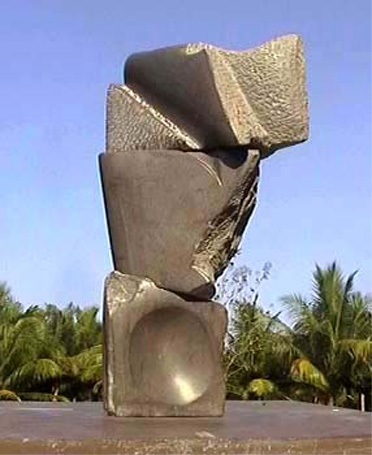 It is a sculpture first and a fountain second with endless associations; visually, subconsciously, and reflective. In memory of the Burgers of Paris by Rodin London. ‘Tira mi su’, is Italian, it translates; ‘pull me up’. It is in fact a delicious sweet chocolate caramel. ‘Tiramisu’ is the organic holding up of the mechanical in metamorphic transition. The illusive blackness of the piece ‘discovered’ rather than made. Found from a point of mechanical bigness and engineered history and industry. It looks toward a fleeting glimpse of greenery – gone in a flash, and hard to remember what it was. What was seen even, only something black and solid amongst the green growth. It is holding up that which has already been ‘pulled’. That which is being held is part of the holding, and that which is holding, is part of the held. 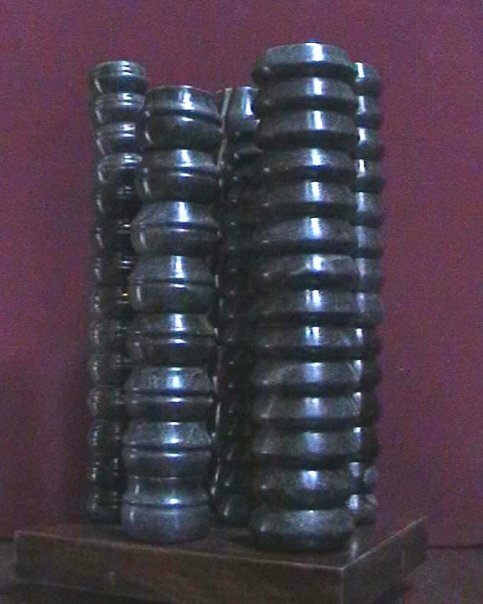 Material; black granite in full size and cast iron untreated and bronze for the 2006 miniature collection. It is a highly sculptured work with absolute precision regarding texture, surface, plain and form. This highly sophisticated piece, developed over a period of more than fifteen years. 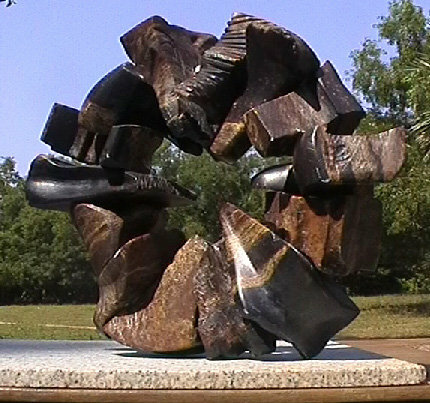 It is truly a sculpture that has emerged from a complex equation. As the title suggests it is, me three. It is indeed three – three points describing a diminishing triangle, which is cut (unevenly) to form the balancing top unit. Although the piece is all mathematics it is a form of mathematics, which is organic, as a nautilus shell. It is a spiral, and is ‘mathematical’, yet in its growth there are natural deviations, as in all creatures. Tri Me is purposefully arrived at though hand and eye precision with use of templates, calipers and so on – until the result is ‘right’. For right is right for the eye and feeling, which Tri Me is all about. Even that it is mathematical it has to be ‘alive’, that is why it has been created. As in the nautilus shell and such creatures, all though mathematical in construction, there is nothing mechanical or repetitive, like machine and computer made objects. Interestingly, Tri Me can never be made the same, just as no two sea-shells of the same species can ever be the same, as in finger prints. Sculpturally it is a piece of serenity, and pure meditative tranquility. It is beyond the notion of the material itself – more a notion only, three is also one of the majestic and highest metaphysical numbers. Tri Me, is part of a trilogy with Y.U.5.? and Seven Pillars. Windsteeth is most definitely a mystique. It is dedicated to the memory of Brancusi. The concept alone took two years to emerge before the first preliminary drawings were sufficient enough to jump to three dimension. The associations of the piece are many. A biting wind, that can blow hot and cold, worn by a sandstorm, or ice and snow. Thoughts that have been polished and become other than they were. Was it a block that has been worn and left thus? The winds teeth – like the huge national monuments in Arizona, or the sand stone sculptures of seashores? It is a complex mathematical piece with a core base equation of negative, curvilinear space, which unlike KnowTwo is not contained, not actual, or measurable. Material; in full size is Italian white Carrara marble, in miniature versions in the 2006 editions are white marble and stainless steel. This is a rare semi figurative sculpture. A woman emerging from, and part of, the water she is giving. 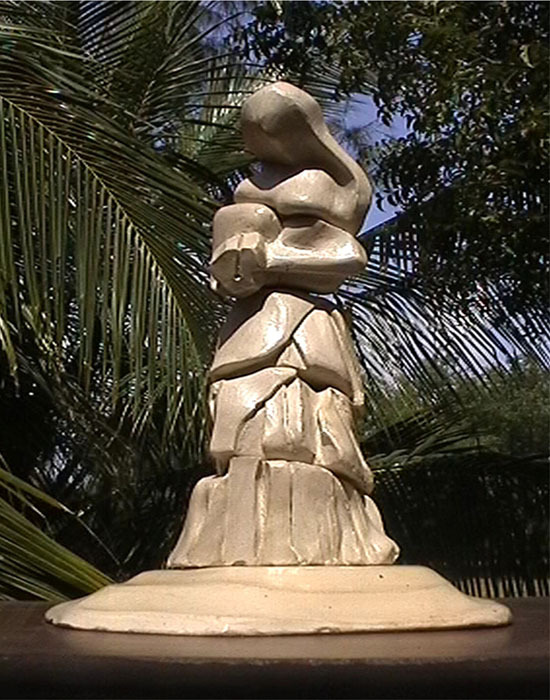 Woman 1 is a sculpture, not a fountain in the true sense of the word yet one version has water spouting from the vessel representing a water pot, and also water coming from her dress cascading down and flowing over the carved base that she stands upon The integrity of the work is that although recognizable as a female figure, it is a sculptural work in five main inter related units. The base is carved and a place she rises from. Each section is separate and has a completeness of its own. She is the graceful figure from the unknown, reminding us of the importance of water. 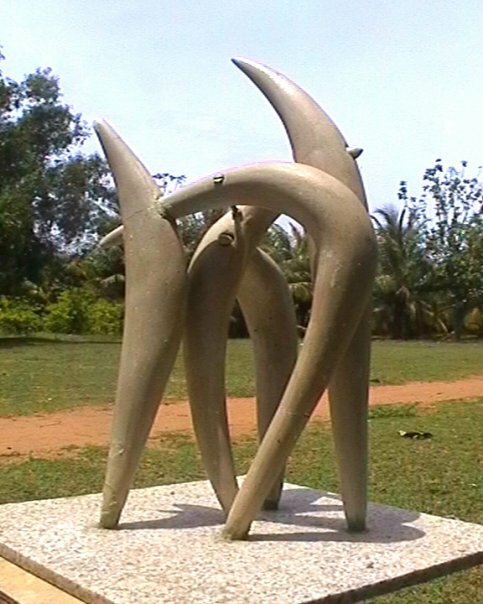 The sculpture in many ways speaks. The form is classical in approach with sculptural references to the Greco-Roman period in Italy – yet it is modern also in that, were it possible not to see a figure in the work, it would maintain the formal levels of linear flow and the balance of curving lines and forms in space. The play of changing light is particularly important and completes what is perhaps best described as a Serenade to life. ‘Why you five’ is a question, the question is why was it that in the beginning of the earths formation there were predominantly five major gasses - Methane, Ammonia, Hydrogen, Helium, and Nitrogen. The poetic question, is why not others? Gasses and compounds like aliens that we cannot name or indeed understand anything of their molecular form or structure, even a structure at all. Y.U.5.? has a definite structure. The elements so called are closely entwined, almost in a dance. They are in segments, segments that form a union, the union of many, potentially the base of a compound different from one another, yet controlled in a system. Y.U.5.? Are the elements, individually ‘dancing’ around each other; the ever-impending change close at hand where units of one chain can be swapped, dislodged, joined, in a different configuration at any moment, a kind of suspense. Y.U.5.? Represents the unknown beginning – or ‘what next, after this, and so on’. Sculpturally it is a form in fairly high mathematically precision. The complex positioning of the columns forms a united piece, which is basically a whole with five units comprising the whole. Light, height and size of each and every aspect form an important part of the work intended to be fundamentally inspired, energy giving and powerful. References are many; Shiva, Parvathy, Ganesha, Saraswathi, Laxmi – the forming of one with five, the echo of abstraction of the Shiva Lingam denoting life itself – as do the five gases. Y.U.5.? Forms one in the trilogy, with the other two being, Tri Me, and Seven Pillars.